We are recruiting top underwriters and teams with established, profitable underwriting who are seeking to take on greater responsibility for leading their own underwriting units and building a book of business as the next stage in their careers. We aim to put senior underwriters in charge of their own businesses; not just underwriting. In turn, underwriting teams have much more influence over all aspects of the business and those in particular which affect their ‘underwriting result’. We enable and support underwriting teams with the resources they need to build a large, profitable book including capacity, systems, marketing, etc. We have a plug-and-play operating environment covering permissions, systems, finance, compliance, etc. We invest resources in accelerating profitable premium growth including marketing, quote-to-bind systems, cross-selling, research capabilities / reports, etc. To be clear, Tempo is not for everyone. 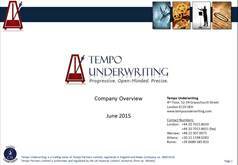 Tempo is designed for proven underwriting leaders and teams who are driven, proactive, collaborative, disciplined, professional and have a clear underwriting conviction. If you fit the above profile and would like to have a confidential discussion, please contact Marco Del Carlo on mdelcarlo@tempounderwriting.com or +44 20 7015 8652.